Preheat oven to 180°C (or 160°C fan-forced). In a large bowl, combine the olive oil, garlic and cauliflower, onion. Toss cauliflower through mix until evenly coated. In a small bowl, combine the remaining dry spices. Sprinkle the spices on the cauliflower, toss until evenly coated. Transfer to a baking sheet, bake for approximately 15 minutes. 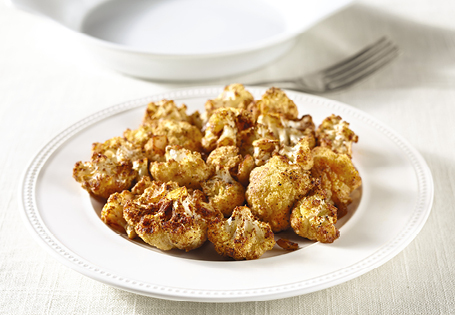 TIP: For crispy cauliflower, you can grill on high for 2-3 minutes.